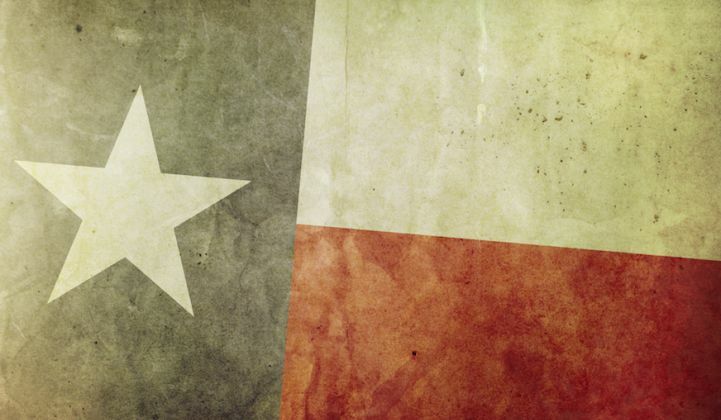 Distributed energy for grid markets gains ground in Texas. Last week, Texas grid operator ERCOT officially disbanded its Distributed Resource Energy & Ancillaries Market (DREAM) Task Force. That’s the group that’s been leading the discussion about how solar PV, batteries, demand response and other distributed energy resources could play a role in the state’s competitive energy markets. But that doesn’t mean that the DER-grid integration it was working on is being abandoned. To the contrary, it’s just getting started. Now that the high-level concepts are done, ERCOT is preparing to accept suggestions for actual market rule changes that bring distributed energy into the state’s energy and ancillary services markets, according to a participant in the process. “The task force was generally set up to help elevate the discussion about distributed energy resources (DER) market integration to a level that would have all of the stakeholders in the ERCOT marketplace pay attention to it,” said Chad Blevins, senior consultant with Austin, Texas-based law firm The Butler Firm and chairman of ERCOT’s Emerging Technologies Working Group. Take the example of Shell Energy Services, an independent power marketer in Texas. At an ERCOT meeting last week where the DREAM task force was officially dissolved, the big commercial and industrial energy service provider presented a slide deck titled “ERCOT-Directed Dispatch of Price-Responsive Distributed Generation.” While the deck is filled with disclaimers, and far from a full proposal, it does lay out a list of values for distributed energy -- specifically, diesel and natural-gas-fired generators -- and how they could be brought into the market. Texas’ deregulated energy market, which lacks a mechanism for procuring long-term capacity, can undergo short but severe spikes in grid power prices, giving energy customers and suppliers reason to look for a hedge. Diesel and gas-fired reciprocating engines can connect at distribution voltage to avoid high interconnection costs, be sized and dispersed across the system, it noted. And, unlike “price-taking” resources like solar PV, which can’t control their output, generators can respond to price within a 1- to 5-minute interval, it noted. The broader goal is to “establish a marketplace where price-taking and price responsive resources can co-exist in an efficient” way, it notes. Shell’s presentation suggests allowing DERs to offer themselves to ERCOT’s Security Constrained Economic Dispatch, which sets the prices and manages the offers based on the locational marginal prices scattered throughout its service territory. Strategically located generators that can supply energy at a price lower than the higher nodal prices can guarantee a revenue for themselves, while helping to drive down prices in the price-formation stage, Shell noted -- something that’s theoretically good for everyone. Shell doesn’t suggest that these distributed generators would participate in the state’s frequency regulation markets right now. But if distributed storage resources emerge as a low-opportunity-cost provider, ERCOT could revisit the subject, it notes -- a nod to the potential for batteries to play a role in keeping grid frequencies stable. Specifically, it “doesn’t get into aggregations explicitly,” insofar as it appears to presume that all of its distributed generators are connected to ERCOT’s real-time, high-speed and high-security telecommunications system. Creating aggregations of more dispersed resources, like thousands of rooftop solar systems, smart thermostats, behind-the-meter batteries or plug-in electric vehicles, may require some different rules for how they respond to ERCOT’s dispatch signals, he noted. That will require the filing of an operating guide revision request, he said. 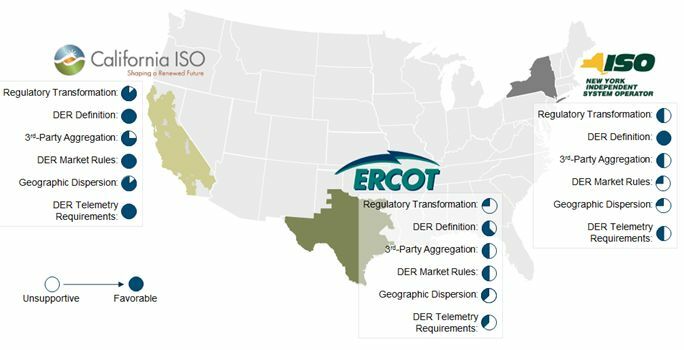 OGRRs are proposals for how ERCOT participants could manage the interconnection of ERCOT’s wide-area network into platforms that manage aggregated DERs, while ensuring latency, reliability, security, and other pertinent issues, he said. Third-party solar providers like SolarCity, which has moved into the Texas rooftop market via its partnership with energy retailer MP2, may well have an interest in modeling the value of solar combined with smart thermostats and other demand-side resources. Behind-the-meter or distribution-grid-connected batteries could also be aggregated at the scale required to participate in ERCOT’s markets. Right now, California is in the lead when it comes to DER integration into wholesale energy markets. The California Independent System Operator launched its proposal for distributed energy resource providers last summer, approved a version in February, and is now working on its tariff development process. New York’s Reforming the Energy Vision proceeding is taking a longer-range, but potentially more radical, approach to DERs as grid assets, but hasn’t yet implemented any specific changes that would allow them to play in wholesale markets. Here’s a map from our recent GTM Research report, Regulating DER Participation in U.S. Electricity Markets: CAISO, ERCOT and NYISO, that lays out the key measures of each state’s approach toward integrating distributed energy into their wholesale markets.